Coking coals because of their special characteristics are suitable for carbonizing to produce blast furnace (BF) coke. 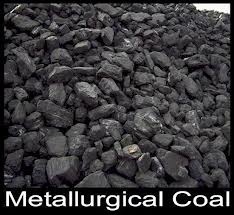 Coking coal is also known as metallurgical coal. Fig 1 shows coking coal. Good coking and caking properties such as fluidity, dilatation and crucible swelling number etc. Properties important for commercial as well as BF operation such as total moisture, ash etc. Properties which affects the properties of hot metal and steel such as percentage of sulphur and phosphorus. Modern coke making practice involves carbonization of a blend of coking coals. Coking coals in blended form are carbonized in a coke oven battery to produce metallurgical grade coke which is suitable for the operation of a blast furnace. Each plant uses its own blend based on the facilities available. In some of the Japanese plants coal blends consists of up to 20 different coals ranging in quality from coals with very high coking properties to coals with almost zero coking properties. The blended coking coal should have desirable coking properties for producing coke of required properties for BF operation. Nice summary of properties and their impacts on the steel process. A very useful summary. Ready reference for any coal technologist.